Step #1: If you haven’t done so, PLEASE CLICK HERE TO Register or LOG IN to continue, this is real important if you ever want to select, save, share, like, or purchase any photos (downloads or prints). If you have already logged in on that computer/device and your information was saved, you can look to the ‘menu’ above right (at the top of the photos window) – it should say your name. From there, go to the menu – to jump to the section you want. All CONCERT images appear first under that section. Contest and all other events will appear under the “Other Images” menu item. 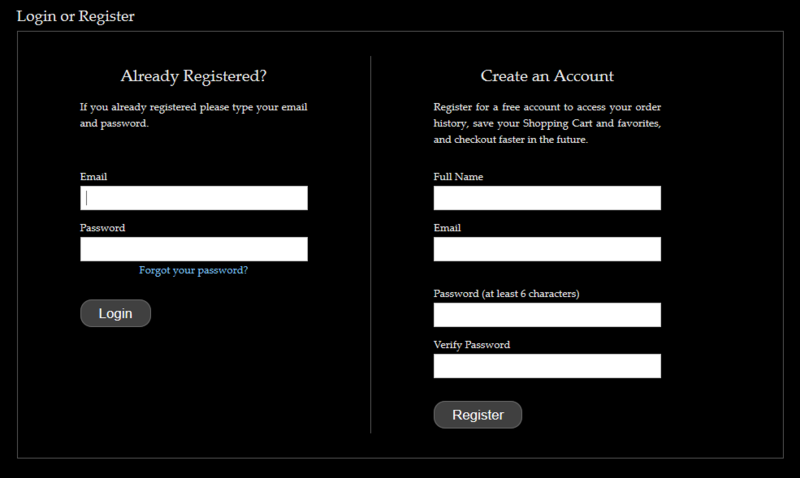 IF YOU HAVE NOT ALREADY REGISTERED, you will need to create one, on the left panel of the log in/register screen. As displayed below, it’s just your name, valid email address, and a password of your choosing. Your login information will be saved, allowing you to access YOUR FAVORITES & order(s) from multiple devices, and will allow you to share your favorites with family & friends for feedback… and their interest. Your password is secure (I can’t see it – ever)… and your personal information is also safe & secure, and not sold other companies. Generally, I only send out a few emails a year, unless it’s in response to questions or orders. IMPORTANT: If you don’t see YOUR LOGIN NAME in the upper right, then you are NOT logged in. The login process must happen on EACH COMPUTER OR DEVICE YOU USE… and when you use the same login, you’ll be able to see your ‘favorites’ listS (selections) for different purposes… and share those lists with me, or even family & friends. Failure to login will drastically limit what you can do, and your ‘favorites’ (heart) list selection(s) will disappear when you close the tab (or exit the app or browser). Again, YOUR NAME will be displayed in the upper right, if you are logged in properly. On the upper left, you’ll see “MY SELECTION” (if you have one yet)… and the number of images currently in that selections list (0) to (____) what ever. Selecting the arrow (after the “(__)” will open the drop down menu for selections. Notice that you can ‘add’ or move between YOUR sets there… when you click on ‘my selection’ (to open the drop down menu options). When you ENTER the Selection (list you’ve created), by actually clicking on it… you’ll see the images in that ‘folder’ (list) that YOU SELECTED… and you’ll see an option to SHARE FAVORITES (on the left)… and to BUY (on the right)… or to display YOUR SELECTION in a SLIDESHOW to show others (below your LOGIN NAME on (below the selection menu options on the left)). ALL my images ARE COPYRIGHTED… some have large watermarks, some small. VetSupplements.com is the company that sponsors & enables me to shoot assorted events and keep the cost of the downloads and prints so low & affordable. If you appreciate that, then PLEASE THANK THEM on your facebook page, and if you have joint, digestion, or general nutritional needs… check out what they have to offer! Other than ‘my name’ (in the lower right, if it exists on an image) the large ‘watermark’ IS REMOVED from images that are purchased (for download or print). IMPORTANT NOTE: if you ‘Select All’ – you can ‘ctrl click’ (or option click, on a Mac) to toggle the select & de-select for each image in your slideshow, download, and buy options. (that’s holding down the ctrl button each time you click, to select or deselect). HOWEVER, IF YOU CLICK ON THE ‘X’ in the upper right of the photo it WILL DISAPPEAR FROM YOUR SELECTION LIST (and you’ll need to re-find, and re-add, it if you wanted it there). So, don’t hit that ‘x’ unless you no longer want THAT image in your selection list. That ‘x’ is basically a ‘delete’ from YOUR SELECTION LIST. Step #2: Select a Gallery, such as CONCERTS, CONTESTS, EVENTS (that aren’t concerts or contests), PORTRAITS, YOUTH EVENTS, SPORTS ACTION, NATURE, etc…. to begin selecting or add to the images you like. Step #3: If you are ‘logged in’ – all your ‘heart’ (favorite) images should add to your ‘selection’ (remember, you can have multiple ‘lists’ in your selections)… but that number should change each time you ‘heart’ or remove a heart from an image. Step #4: When you are done, go to YOUR SELECTION – pick the list you want to work with – and then, you can a) click and hold an image, to ‘move it’ by dragging it before (or after) other images in your list… (like an order of importance to you), b) SHARE the selection list with me (or your family & friends, to get their input), and/or c) Select some or all of your selection list to purchase… downloads or prints of. Step #5: If you have ANY questions, or problems, PLEASE CONTACT ME… with as many details as necessary for me to help you. Step #6: ENJOY! ~ to see the images, AFTER YOU HAVE LOGGED IN, merely go to the PHOTO STORE in the menu… CONCERTS, CONTESTS, or HUB (for most RESENT images uploaded). If you are looking for something older, in the Portraiture, Events, Youth Events (for the kids & their families), Sports, Nature, etc. categories, click on MY PHOTOS from the menu after your log on, to see the other categories. At the present time, you can view, favorite, and select from a cell phone or tablet… but SOME phones can not open the ‘zip file’ when multiple images are purchased. So, either purchase one at a time… or do so FROM A COMPUTER (you only need to log in or open your purchase email from a computer). Downloads are printable – at home, Cost-co, Sam’s Club, Walmart, Walgreen, Wolfe Camera, or any other place you choose to take those images… and there is also a print option, and I can take care of the proper printing for you from 4×6 to poster sizes. When you purchase downloads: Keep your receipt, and there shouldn’t be any issue or problem for PURCHASED DOWNLOADED IMAGES (they are authorized to print your purchased downloads with proof of receipt up to 8×10 size). The ‘web ready’ downloads will print out to 4×6, the ‘print ready’ downloads print out perfectly to 8×10… however, you’ll need to make sure who ever prints the images MUST TURN OFF THE AUTO-ADJUSTMENTS, other than cropping, I HAVE ALREADY DONE THE ADJUSTMENTS and the colors will look terrible. I do not authorize printing of non-purchased images. In regards to downloading using a mobile device, you will need to have access to your valid email account (where you ordered from), AND an app in your device that opens zip files in order to download zip files. There are free apps available that can provide this function. For iOS users, one such app is called iZIP which can be found in the App Store.. Most Android users will be able to download the zip file and unzip with without any additional apps. However if needed, you can use any app available in the Google Play store to unzip the zip file.